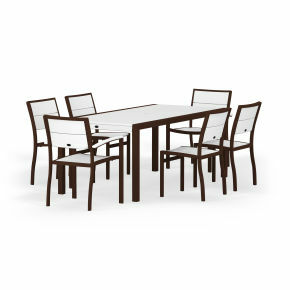 Turn the tables on ordinary outdoor dining and entertaining with the sleek and sophisticated POLYWOOD® Metro 6-Piece Dining Set. As much a work of art as it is a comfortable place to gather, this stylish set includes two Metro Side Chairs, two Metro Arm Chairs, one MOD SOLID™ Bench and one MOD SOLID 36" x 73" Dining Table. 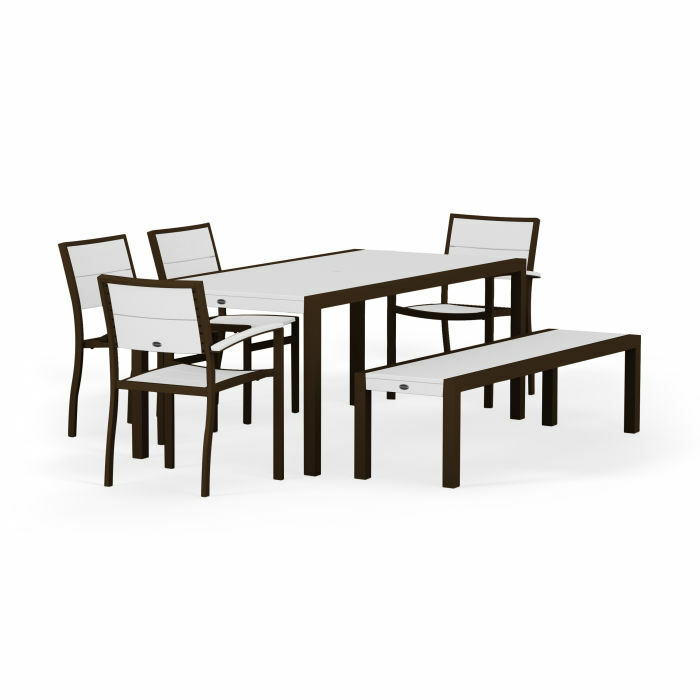 Turn the tables on ordinary outdoor dining and entertaining with the sleek and sophisticated POLYWOOD® Metro 6-Piece Dining Set. As much a work of art as it is a comfortable place to gather, this stylish set includes two Metro Side Chairs, two Metro Arm Chairs, one MOD SOLID™ Bench and one MOD SOLID 36" x 73" Dining Table. You'll love how the attractive color combinations coordinate perfectly with any décor. This durable set is constructed of sturdy aluminum frames and SOLID marine grade polymer (MGP). And talk about low maintenance, this dining set withstands nature's elements while resisting corrosive substances, salt spray and other environmental stresses.